Last year I had the pleasure of discovering Aussie artist Carolyn O’Neill. Abstract art that’s truly something to behold, I saw one of her pieces pop up on The Block last week and they’re no doubt taking the country by storm. This just goes to show, of course, that The Life Creative is always ahead of the game – shining the light on local talent before they go global! 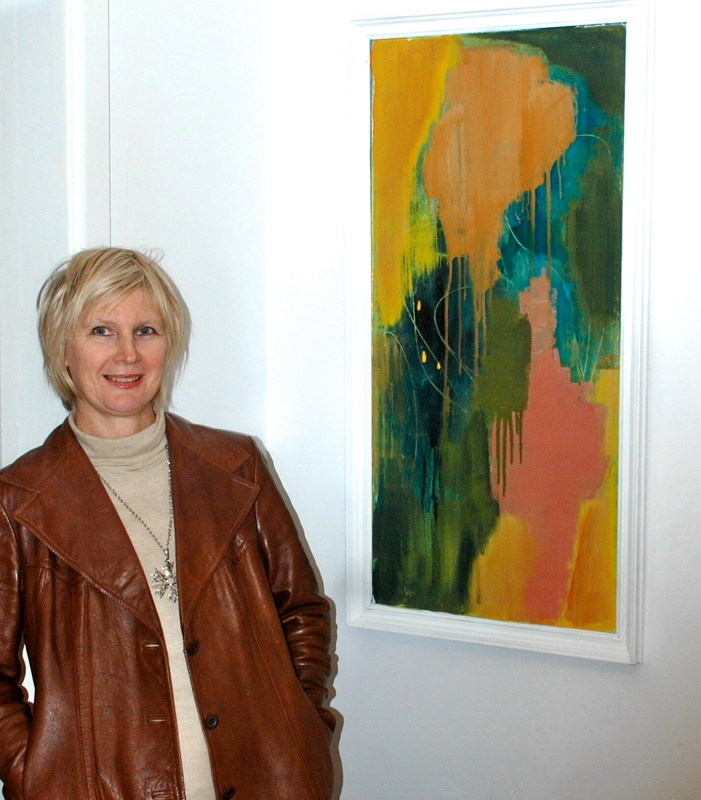 Below is the feature on Carolyn and her work. Enjoy discovering more about this unique lady. 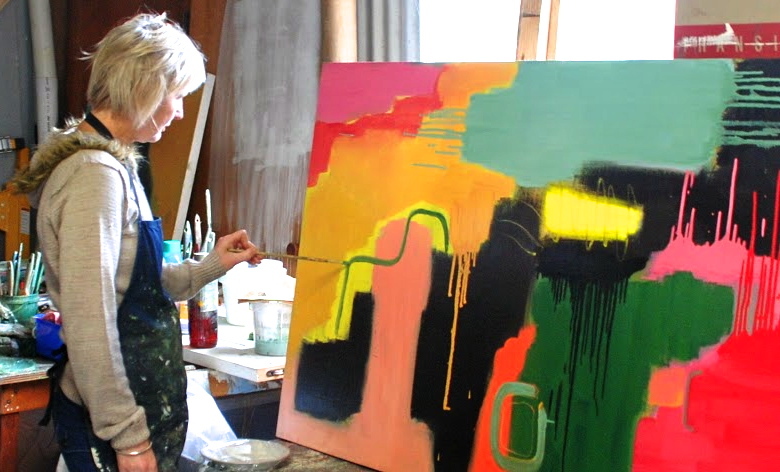 A beginner painting course in 2003 unlocked something in Bendigo-born abstract artist Carolyn O’Neill, leading her to leave behind her career as a psychiatric nurse. “My past occupation has made me more aware of human emotions and the fragility of the mind, including my own,” she says. I don’t know about you, but I think a story this interesting needs exploring. And explore it I did, when I spoke with the artist – who now calls Hamilton home. Art aside for a moment, I was both surprised and delighted to discover that we share a very similar home decor style. “I’m an avid op-shopper and collector of Mid Century homewares and vintage interior decorating,” Carolyn confesses (I hear you loud and clear!). “My home is an eclectic mix of old and new with lots of vintage collectables”. The transition from nurse to artist was a gradual one, she tells me, with the support of her family firmly in place. She admits, though, that seeing her works on display can be a little confronting. “For me it’s like opening up my journal for all to see. [Though] my central goal is for the work to have an emotional connection with the audience; if that is achieved, then perhaps I’m on the right track”. Her abstract art pieces have certainly had an impact on me, my favourite being Undercurrent, one of her past works, because I love the blue and green tones she’s used in it. She overcomes artists block by taking some time away from her pieces. “If a painting isn’t working I know that if I don’t leave it alone I’ll probably ruin it. Going for a walk, flicking through magazines and art books for inspiration is also beneficial,” she tells me, “Because I work in oils, the painting needs time to dry, so I work on several at a time in stages and usually work out how to resolve one whilst working on another”. Carolyn is currently preparing for a group show in August with the Manyung Gallery Group and will possibly undertake a solo show later in the year. “I’d like to enter something for The Blake Prize but the deadline is looming… perhaps next year”. 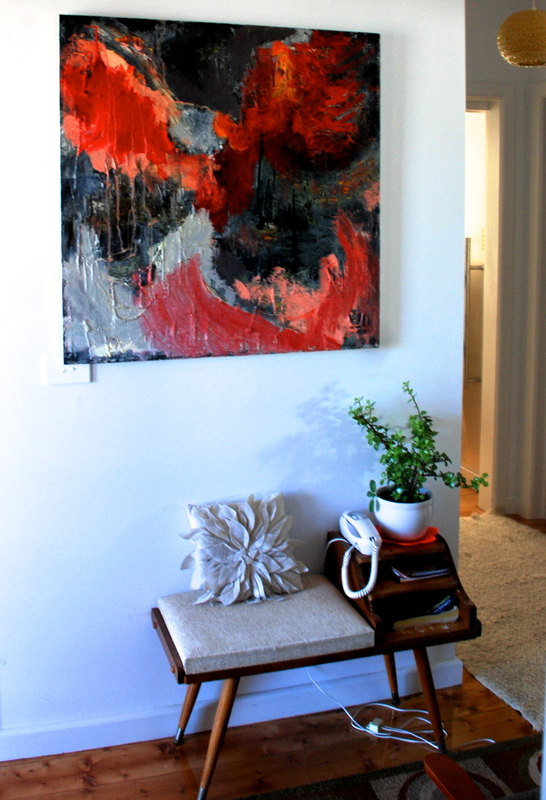 I’m personally head over heels for her abstract art and the interesting story behind each artwork. It’s clear her time as a nurse has had a very distinct impact on her work. Carolyn herself appreciates how much it’s made her understand the need for self expression. “Some of the best songs would not have been written, great films never made and famous paintings never created without it”. Want to know more about The Block? Read our ultimate guide to every season! You can see more of Carolyn’s amazing pieces, including her full bio and CV over on her website – http://www.carolynoneill.com.au. Loved this blog interview…so good to see inside the artist’s home, and hear about the inspiration behind her art. I certainly feel an emotional connection with this Artist and her paintings, also love the retro interior wow! The art fits so well. Thanks for the creative inspiration. Thanks for your comment Janine. I totally agree; seeing inside Carolyn’s home made such a difference! I love her story as well. Very glad to be sharing it with you all. I absolutely love Carolyn”s work. The colours and the abstract art is very thought provoking and beautiful. Well Done Carolyn your work is inspirational. You have a gift. Thanks Michelle – I am glad you love her work as much as I do. If only I was in Melbourne so I could see it in person. It’s just lovely (and the story behind them is so interesting). I really enjoyed this interview and the inspiration for these remarkable pieces. 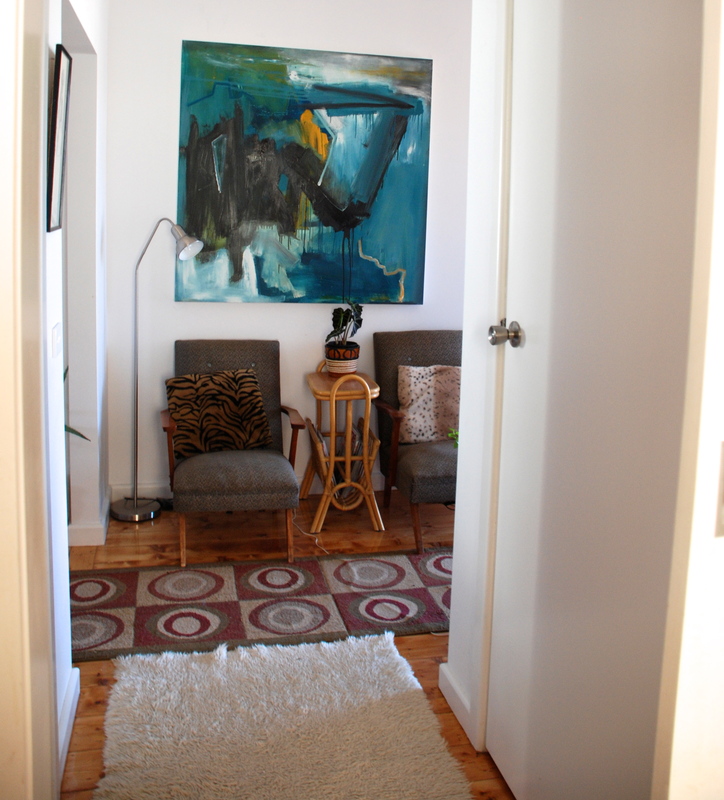 The artist has an obvious artistic flair for interior design as well as oils. A very insightful snapshot into the congruent world of a truly talented Australian. Look for ward to seeing and hearing more of her. I find it hard to believe that a working artist has much time to keep the house tidy. Is there any creative clutter in that home? I’m certainly interested in checking out her exhibitions. I know right – the art is amazing, the house is amazing! It’s all a bit blissful! Thank you so much tlcreative for taking an interest in my work and showcasing it on this wonderful blog. I would also like to thank everyone for their very kind comments and support. I feel very blessed to have had this opportunity to share my artist journey, my home and my art! Carolyn you are more than welcome. Thank you for sharing your world with me! It is a very inspiring story of tapping into your creativity and making something of it. It’s lovely.